When you need lawn or landscape maintenance in Northern Virginia, give us a call and we’ll respond with a free estimate the same business day. Weekly mowing services – We can start cutting your lawn the same week you request your estimate! Call us for a landscape design and build consultation, and we’ll respond the same business day. Our design process can be described in four simple phases. Request for proposal – When you contact O’Grady’s to schedule a design consultation, we will first gather some general information including your address and a very brief description of the work you are considering. At that time, we will schedule an appointment. Initial consultation – During your initial consultation, one of our designers will meet with you and walk through the property to discuss your project. 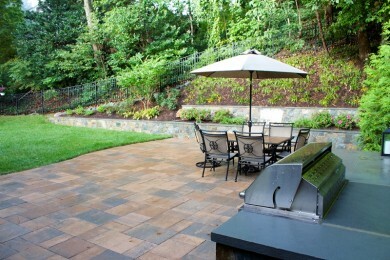 We break jobs down into discrete “projects,” such as a patio, walkway, or privacy screen. All our estimates include a written description (and possibly a drawing) of each project. Most estimates consist of three or four written projects with a drawing of the work. Estimates are free and are usually delivered within a week. Creating the design – The actual estimate and drawing are created back at our office. Our designers review notes and pictures of the property. We consider all of the information gathered during the initial consultation and produce a landscape plan that is attractive, functional, and suited to your needs. We are prompt in getting proposals out to customers; you can expect a complete plan within a week of your initial consultation. Reviewing plan and scheduling – Once you have received our estimate and have had some time to review the plan, we will call you to follow up and discuss any questions. If re-writes are necessary, they are done at this point. Once the proposal is accepted, we will schedule your work. We can usually start jobs in three to four weeks, depending on their size and scope. If you are located in Northern Virginia and are interested in a lawn maintenance estimate or landscape design consultation, contact us. We offer prompt, reliable service to properties in Sterling, Fairfax, Reston, North Arlington, McLean, Vienna, Great Falls, and the City of Falls Church.